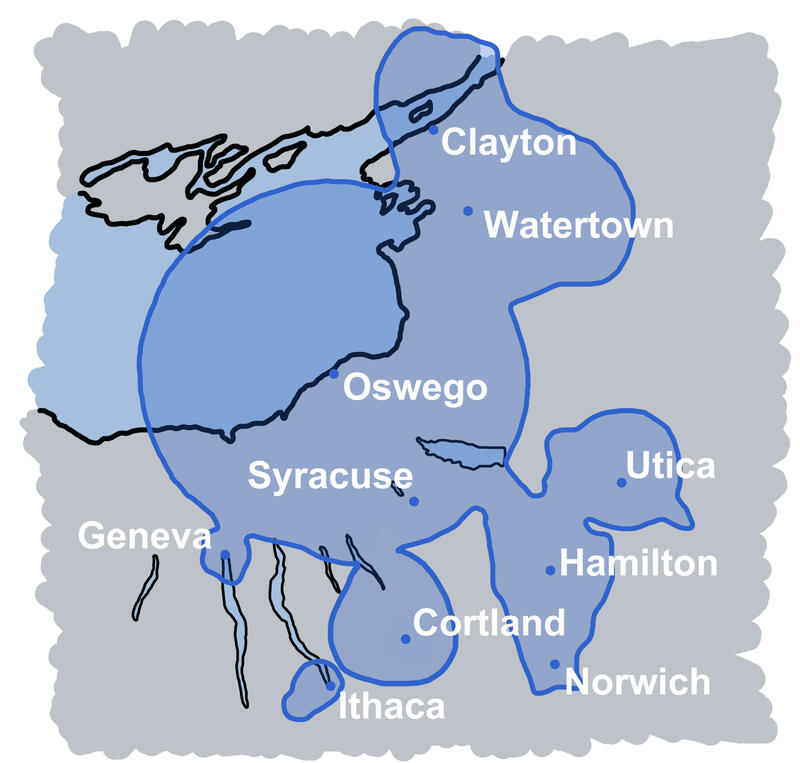 WRVO Public Media is a non-profit, non-commercial, multi-platform news and information service for residents of central and northern New York state and a member station of NPR. Broadcast studios and administrative offices are located on the campus of the State University of New York College at Oswego. WRVO employs about 13 professional staff in management, business, news, corporate underwriting sales, operations, and engineering. A satellite studio is located in downtown Syracuse. WRVO-1, NPR News, the primary broadcast service featuring programs produced by NPR, American Public Media, Public Radio International, and WRVO Public Media, among others. WRVO-1 is broadcast over WRVO-FM and ten regional FM transmitters, online, and with our mobile app. WRVO-2, PRX Remix, is an eclectic mix of short features from public radio stations across the country. WRVO-2 is available on the web and with our mobile app. WRVO-3, WRVO International, presents live news and information programming from the BBC. WRVO-3 is available online and on our mobile app. Full-time low-power WRVO-FM repeaters are located in Geneva at 90.7FM, Ithaca at 92.5 FM and 104.5 FM, Norwich at 89.9 FM and Rome at 92.3 FM. All three WRVO program streams are available online, and on your iPhone, iPad and Android mobile devices. Free WRVO apps are available for download from the Apple Store and Google Play. Stay in touch: Find out what's happening at the station with our biannual newsletter "Listen!" You can access current and past issues of our print newsletter online. If you'd like more regular updates, you can also sign up for any of our email newsletters. Internships: Qualified students enrolled at the State University of New York at Oswego (or surrounding colleges) are welcome to apply for internships at WRVO. At WRVO Public Media we're more than radio. We're a hub of regional news and programming content that suits the interests of our many listeners. Our reporters cover the news in portions of 20 counties of central and northern New York. Only stories with the highest level of journalistic integrity are featured on our site for the purpose of educating our listeners. Simplicity, depth and ease-of-access are the framework of our daily news updates and web design. With a completely responsive design, easily viewed on a mobile device or computer, WRVO.org gives the visitor all of the days news -- from human interest stories to state politics -- without sacrificing quality or journalistic form. Our website also provides updates about the status of our transmitters and other station announcements. SUNY Board of Trustees Public Hearings: The Board of Trustees of the State University of New York and its Committees regularly meet. Members of the public are invited to attend. More information is available here. Public File: The Federal Communications Commission (FCC) requires broadcast stations to make certain documents available online to the public. Public File documents for the WRVO stations can be found here. Most recent audited financial statements are posted below.